Enduring the physical and psychological consequences of having a cancer diagnosis is only the beginning of the battle. Cancer patients then have to deal with grueling treatment cycles and associated side effects. The high doses of radiation used to destroy cancer cells can also damage adjacent healthy tissues. Although major improvements in radiation technology such as intensity modulated radiation therapy have led to reduced toxicity, these methods tend to be complex requiring several planning steps and safety checks before the patient can start treatment. 3D printing is promising to solve some of these problems and aid in providing personalized cancer treatment. 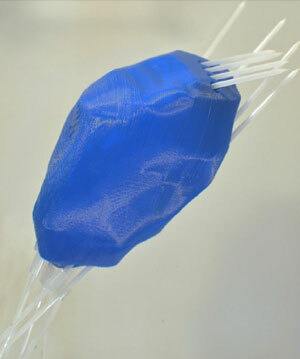 One such application of 3D printing is in the production of customized bolus and shields used during radiotherapy. A bolus is an artificial object placed over the treatment area in order to modify dose both at the skin surface and at depth while a shield is used to protect adjacent structures not intended to be exposed to radiation. 3D printing can be used to design customized bolus and shield that fit a patient’s unique anatomy perfectly. Additionally these precise models ensure even distribution of radiation dose to the targeted area while sparing adjacent normal tissues. This technology is especially beneficial to patients with head and neck cancers where susceptible organs such as the eyes and ears are located in close proximity to the target and where surface anatomy of the face is varied among different individuals. Traditional approaches of fabricating shields involve casting of several molds, which are expensive, time consuming and labor intensive. 3D printed shields can be easily and cost effectively created from existing CT/MR images without subjecting sick patients to be present during the fabrication process. Another application of 3D printing is in Brachytherapy where a radiation source is implanted inside the body next to the area requiring treatment. Under current practice, a one-size-fits-all approach is utilized where standardized implants with internal channels that guide the radiation source are inserted into the body. Standardized implants do not conform to patients’ specific anatomy and precise positioning is often challenging. These implants are also prone to shift during movement resulting in suboptimal dose to the target and unwanted exposure to adjacent organs. Patients are therefore required to remain immobile over the course of a treatment to maintain optimal positioning between the radiation source and treatment target. 3D printed customized implants provide a much better fit and are easier to place thereby increasing patient comfort and reducing shifts due to movement or changes in bladder or bowel distention. Customized implants with curved internal channels can also be used to reach targets that may not be accessible with existing standardized implants. 3D printing appears to provide a rapid, practical and inexpensive approach to deliver homogeneous dose to the target area while minimizing unwanted exposure to adjacent normal tissues. Furthermore this technology minimizes patient discomfort and allows provision of cancer therapy that is tailored to each individual. Next entry Which 3D printer should you get? Wonderful article Tatiana! Thanks for sharing. Late last year I read an article about 3D printing filament with radiation attenuation properties, which would allow for creation of customized radiation shields with cheap, desktop FDM printers. Here is the link. It seems that will a combination of improving techniques and materials, 3D printing is poised to really revolutionize the field of radiation oncology. Thanks Mike! That is really interesting. It seems like we have only seen the tip of the iceberg when it comes to applications of 3D printing in medicine and many more applications are going to be evident as this technology continues to be explored.